In 2011, Gardens by the Bay was opened in Singapore. The aim was to create a city in a garden that would contribute to making the city more comfortable to live in. During the design phase of Gardens by the Bay, there was a lot of attention given to making the park eco-friendly. The result is symbiosis, a principle based on a circle economy that connects the different attractions of the parks by making the waste product of one the resource of another. Underlying the concept of Gardens by the Bay are the principles of environmental sustainability. Much effort was made to plan and design for sustainable cycles in energy and water throughout Bay South Garden. Comprising two glass biomes, the Conservatories replicate the cool-dry climate of the Mediterranean and semi-arid sub-tropical regions and the cool-moist climate of the Tropical Montane region. They house a diverse collection of plants that are not commonly seen in this part of the world and are of high conservation value. The conservatories are a statement in sustainable engineering and apply a suite of cutting-edge technologies for energy-efficient solutions in cooling. This suite of technologies can help to achieve at least 30% savings in energy consumption, compared to conventional cooling technologies. The two conservatories are fitted with specially selected glass that allows optimal light in for plants, but reduces a substantial amount of heat. The roof is fitted with a sensor-operated retractable sails that opens automatically to provide shade to the plants when it gets too hot. The Conservatories apply the strategy of cooling only the lower levels, thus reducing the volume of air to be cooled. This is achieved through thermal stratification – ground cooling by chilled water pipes cast within the floor slabs enabling cool air to settle at the lower occupied zone while the warm air rises and is vented out at high levels. To reduce the amount of energy required in the cooling process, the air in the Flower Dome is de-humidified by liquid desiccant (drying agent) before it is cooled. This desiccant is recycled using the waste heat from the burning of the biomass. Electricity is generated on-site to run the chillers that cool the Conservatories. At the same time, waste heat is captured in the process to regenerate the liquid desiccant. 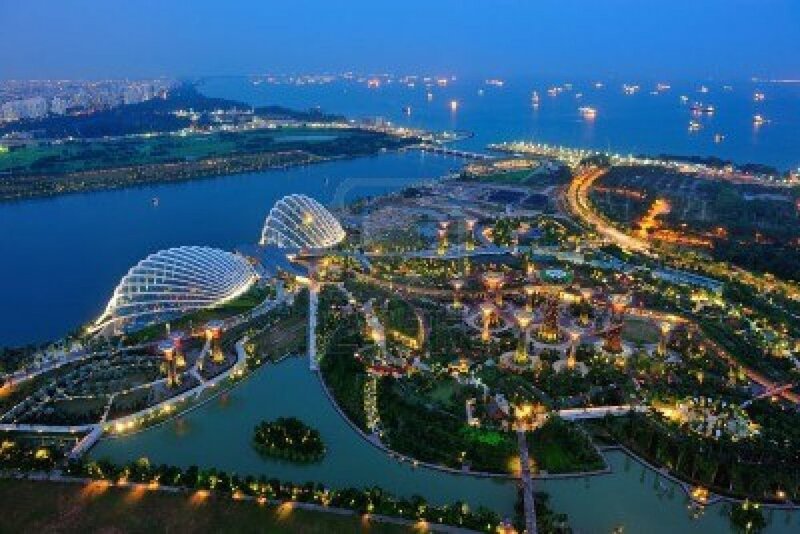 This co-generation of energy is achieved by the use of a Combined Heat Power (CHP) steam turbine that is fed by horticultural waste from the Gardens and other parks around Singapore. This reduces dependency on the electrical grid. Eleven of the Supertrees are embedded with environmentally sustainable functions. Some have photovoltaic cells on their canopies to harvest solar energy for lighting up the Supertrees., while others are integrated with the Conservatories and serve as air exhaust receptacles. The Gardens lake system incorporates key ecological processes and functions as a living system. It acts as a natural filtration system for water from the Gardens catchment and provides aquatic habitats for biodiversity such as fishes and dragonflies. Encompassing two main lakes – the Dragonfly Lake and Kingfisher Lake, the lake system is designed to be an extension of the Marina Reservoir. Water run-off from within the Gardens is captured by the lake system and cleansed by aquatic plants before being discharged into the reservoir. Naturally treated water from the lake system is also used in the built-in irrigation system for the Gardens. The lake system depicts the role and importance of plants in the healthy functioning of our ecosystem. It raises awareness of the value that aquatic plants play in nature, and highlights the significance of clean water in sustaining biodiversity. Filter beds, comprising of aquatic reeds, and wetlands are located where water enters and discharges from the lake system. Water ﬂow is reduced and sediments are ﬁltered out. Islands of aquatic plants and reed beds are incorporated to absorb nutrients such as nitrogen and phosphorus in the water. A reduction of nitrogen levels is critical to minimising alga bloom and ensures better water quality. Habitats for ﬁsh and dragonﬂy are created within the lake system by maintaining a diversity of aquatic plants, good water circulation and aeration. This keeps in check potential problems such as mosquito breeding.